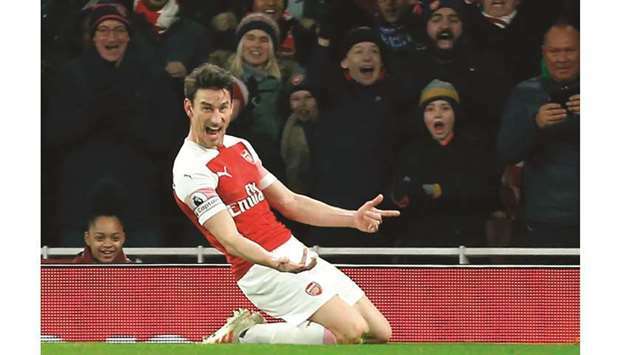 Arsenal’s French defender Laurent Koscielny celebrates after scoring their second goal against Cheslea in London yesterday. Arsenal revived their hopes of a top-four finish with first-half goals by Alexandre Lacazette and Laurent Koscielny securing a comfortable 2-0 derby win at home to Chelsea yesterday. Victory, only Arsenal’s third at home in the league against Chelsea in 10 years, left them in fifth place but cut the gap on their fourth-placed London rivals to three points. 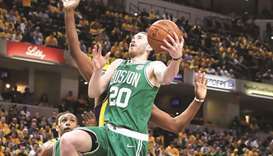 A scintillating first half saw chances galore for Unai Emery’s side who began the match in sixth spot after Manchester United’s earlier win against Brighton and Hove Albion. Marcos Alonso headed against the post on the stroke of halftime for Maurizio Sarri’s side who were perhaps fortunate not to be further behind at the interval. Not even the introduction of former Arsenal striker Olivier Giroud could liven up Chelsea’s blunt attack. Meanwhile, Newcastle United leapfrogged Cardiff City to push the Welsh club back into the relegation zone after a 3-0 win at St James’ Park that featured a double from Fabian Schar, his first goals for the club.